Joint planning consists of planning activities associated with joint military operations by combatant commanders (CCDRs) and their subordinate joint force commanders (JFCs) in response to contingencies and crises. It transforms national strategic objectives into activities by development of operational products that include planning for the mobilization, deployment, employment, sustainment, redeployment, and demobilization of joint forces. It ties the military instrument of national power to the achievement of national security goals and objectives and is essential to securing strategic end states across the range of military operations. Planning begins with the end state in mind, providing a unifying purpose around which actions and resources are focused. Joint planning is the deliberate process of determining how (the ways) to use military capabilities (the means) in time and space to achieve objectives (the ends) while considering the associated risks. Ideally, planning begins with specified national strategic objectives and military end states to provide a unifying purpose around which actions and resources are focused. The joint planning and execution community (JPEC) conducts joint planning to understand the strategic and operational environment (OE) and determines the best method for employing the Department of Defense’s (DOD’s) existing capabilities to achieve national objectives. Joint planning identifies military options the President can integrate with other instruments of national power (diplomatic, economic, informational) to achieve those national objectives. In the process, joint planning identifies likely benefits, costs, and risks associated with proposed military options. In the absence of specified national objectives and military end states, combatant commanders (CCDRs) may propose objectives and military end states for the President’s and/or the Secretary of Defense’s (SecDef’s) consideration before beginning detailed planning. The Chairman of the Joint Chiefs of Staff (CJCS), as the principal military advisor to the President and SecDef, may offer military advice on the proposed objectives and military end states as a part of this process. At the strategic level, joint planning provides the President and SecDef options, based on best military advice, on use of the military in addressing national interests and achieving the objectives in the National Security Strategy (NSS) and Defense Strategy Review (DSR). At the operational level, once strategic guidance is given, planning translates this guidance into specific activities aimed at achieving strategic and operational-level objectives and attaining the military end state. This level of planning ties the training, mobilization, deployment, employment, sustainment, redeployment, and demobilization of joint forces to the achievement of military objectives that contribute to the achievement of national security objectives in the service of enduring national interests. Joint planning is end state oriented. Joint plans and orders are developed with the strategic and military end states in mind. The commander and planners derive their understanding of those end states from strategic guidance. Strategic guidance comes in many forms and provides the purpose and focus of joint operation planning. Joint operation planners must know where to look for the guidance to ensure that plans are consistent with national priorities and are directed toward achieving national security goals and objectives. Joint planning provides a common intellectual framework for the joint force, its subordinate and higher headquarters, the JPEC, and DOD leadership from which to adapt to the dynamic operational environment (OE). Adaptive Planning and Execution Enterprise (APEX) incorporates planning detail, frequent IPRs, continuous assessment, and collaborative technology, which provide increased opportunities for consultation and guidance during the planning process. 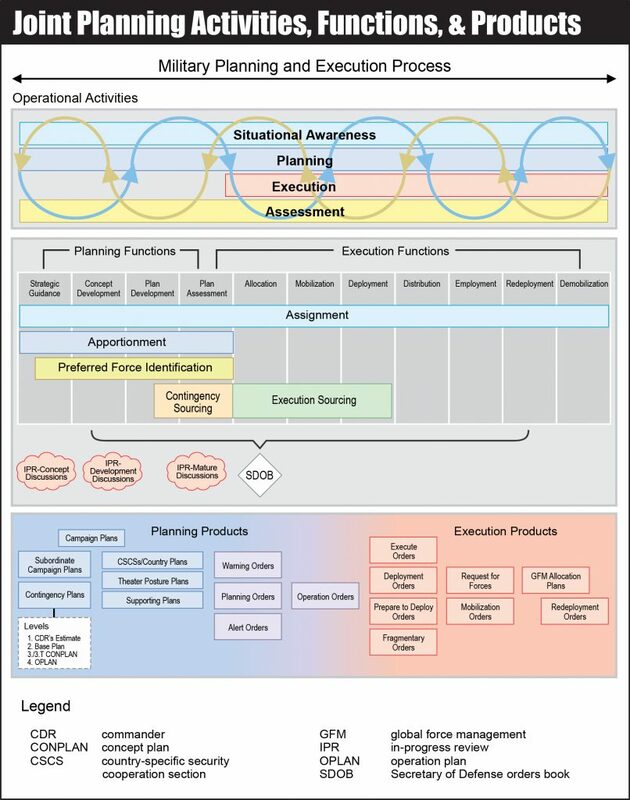 Adaptive Planning and Execution Enterprise (APEX) encompasses four operational activities, four planning functions, seven execution functions, and a number of related products. While joint planning has the inherent flexibility to adjust to changing requirements, APEX incorporates policies and procedures to facilitate a more responsive planning process. APEX fosters a shared understanding of the current OE and planning through frequent dialogue between civilian and military leaders to provide viable military options to the President and SecDef. Continuous assessment and collaborative technology provide increased opportunities for consultation and updated guidance during the planning and execution processes. APEX encompasses four operational activities, four planning functions, seven execution functions, and a number of related products. Each of these planning functions will include IPRs as necessary throughout planning and execution. IPR participants are based on the requirements of the plan. For example, plans directed by the GEF or JSCP generally require SecDef-level review, while plans directed by a CCDR may require only CCDR-level review. IPRs are an iterative dialogue among civilian and military leaders at the strategic level to gain a shared understanding of the situation, inform leadership, and influence planning. Topics such as planning assumptions, interagency and multinational participation guidance, supporting and supported activity requirements, desired objectives, key capability shortfalls, acceptable levels of risk, and SecDef decisions are typically discussed. Further, IPRs expedite planning by ensuring the plan addresses the most current strategic assessments and objectives.